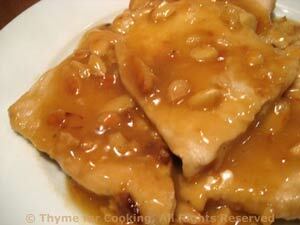 Turkey with Sherry and Almonds, Thyme for Cooking's Healthy Weekly Menu. Thinly sliced turkey cutlets cook quickly and lend themselves well to all types of sauces and treatments. If you can't find them you can substitute chicken breasts or get a turkey tenderloin or breast and either slice it yourself or have your butcher do it for you. I used whole almonds, roughly chopped. Much more economical than the traditional veal cutlets, breaded turkey with a light sherry and almond sauce is an impressive, but simple dish. Put flour in flattish dish. Dredge turkey breasts in flour, coating both sides. Heat oil in a large nonstick skillet. Sauté turkey cutlets over medium-high heat, until golden brown, turning once, 2 - 3 minutes per side. Add butter to pan and heat. Add almonds and sauté until toasted, about 5 minutes. Add sherry and chicken stock to pan to deglaze. When sherry/stock is simmering add cornstarch, stirring until thickened. Briefly return cutlets to pan to heat through. To serve, put turkey cutlets on small platter and spoon sauce over the top. 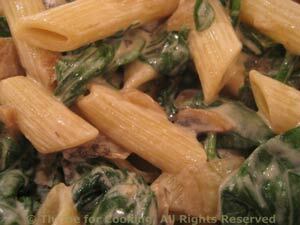 While pasta cooks: Wash spinach (if necessary) and roughly chop. Chop onions and mushrooms. Mince garlic. Remove from heat and stir in soy sauce and yogurt.